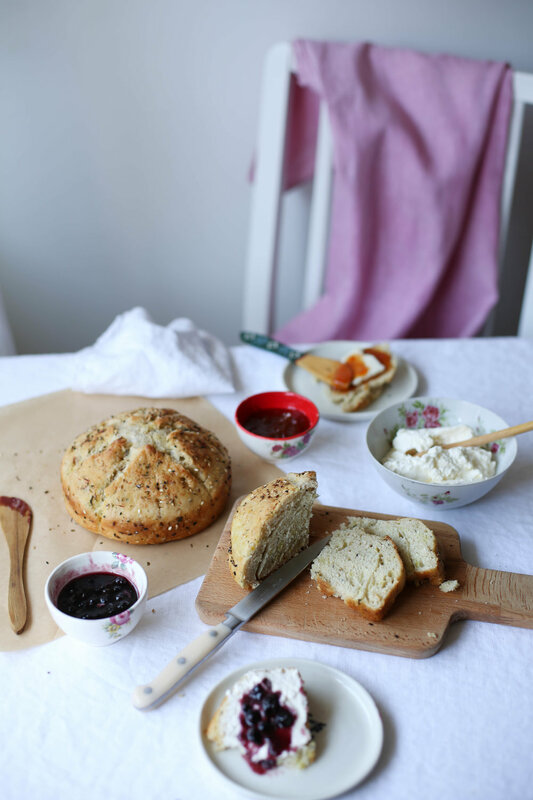 Kopoo is the name of a homemade bread that used to be very popular in Kerman. Mom says that she learned making Kopoo from Haji-Nesa; a red-hair woman who would bake bread in the ground oven at my grandma's house every week. What makes Kopoo so special and unique is the addition of herbs and spices that Kermanians call "Tokhmee". Just like Italians have their own blend of herbs to make bread, we use a mix of seeds, herbs, and spices to make this bread. Traditionally Kopoo is made with whole wheat flour, I didn't have any at home so I used all purpose flour, but I have to say it tastes much better with the whole wheat. I used two small cake pans and the bread got tall, but if you use a large 9" cake pan Kopoo will have more room to breath and won't be as tall as mine is in the picture. Dissolve the sugar cube and yeast in the 1/2 cup of warm water and let stand for 5 minutes until frothy and foamy. Brush a medium bowl with olive oil and transfer the dough to the bowl and cover with a kitchen towel and keep in a warm place for an hour or until the dough doubles in size. Preheat the oven to 400°F (204°c). Use a 9" cake pan or any pans that you can place in the oven, I usually use my cheesecake pan, but any pan will do it. Brush the pan with some olive oil, transfer the dough to the pan and ensure that it has a round shape, let it the dough rest again in the pan for 5-10 minutes. Use a sharp knife and cut the dough into six to eight slices and sprinkle with "Tokhmei". You know I love to hear from you, so please take a moment and write to me, let me know if you like this recipe, share it with your friends or anyone who would be interested in a taste of Persian baking. Until another time that we hang out together, know that I LOVE you and You are amazing! As I was sharing with you guys on Instagram, I've added the link to Yasmin Khan's article on travel ban and how breaking bread can help.